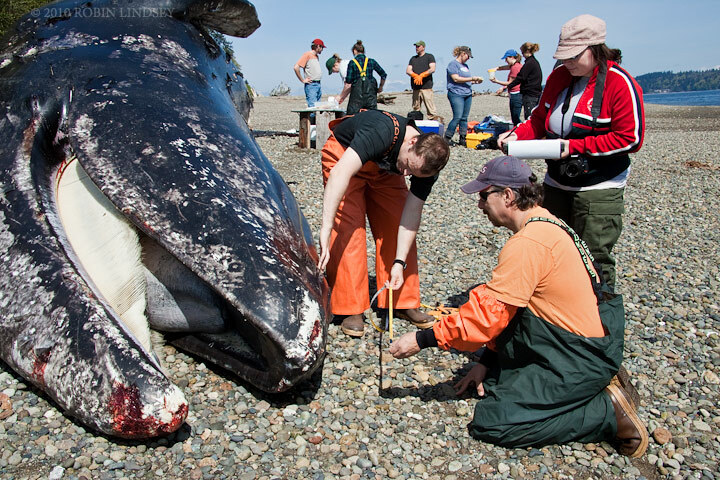 Ocean Plastics, Trash Sabotage Young Gray Whale’s Life – Neptune 911! Editor’s Note: The gray whale is currently in migration from their summer feeding grounds in the Artic Ocean to their birthing and breeding grounds in Mexico. To follow a gray whale’s migration route and for more about the dangers these whale face during their migration visit A North Pacific Gray Whale Obstacle Course. Highlighted portions of this reproduced story were highlighted by Neptune 911. Kristin and orca researcher, Jeff Hogan, immediately began to assess the animal and take measurements. I noticed Jeff’s young son, dwarfed by the massive body, wide-eyed as if trying to take it all in. Why had the whale died on our Salish Sea shore? I could not ignore the gnawing feeling that somehow we had played a part. The thin whale, a male measuring 37 feet, was estimated to be 3-6 years old (a gray whale’s lifespan is 50-70 years). The massive creature needed to be towed to a remote location where biologists could perform their work. As we left, Kristin began making calls, arranging the logistics for a move and necropsy. A volunteer from MaST* offered his boat and towed the body to a restricted island south of Tacoma. Two days later, boats carrying biologists and volunteers from WDFW’s Marine Mammal Investigations Unit, Cascadia Research, NOAA Fisheries and other local stranding networks landed on the island. Crates of gear and coolers were shuttled onto shore and the business of unraveling a mystery was begun. Cascadia researcher Jessie Huggins was perched high atop the back of the whale cutting blubber samples. Dyanna Lambourn, WDFW biologist, examined vital organs amidst seeming miles of intestines. Others were collecting and labeling samples, entering data. It was an impressive sight. Cascadia’s renowned cetacean researcher John Calambokidis explored the contents of the whale’s stomach. He noted there was a significant amount of algae with little evidence of food. He reached his hand inside the whale and removed a piece of plastic. Then, a length of rope, a golf ball, a plastic bag, a piece of cloth. Another piece of plastic, more cloth. Duct tape. A towel. Electrical tape.Fishing line. More rope. Surgical glove. Plastic funnel. More plastic bags. A huge piece of fabric – it was half a pair of sweatpants. Work around us stopped and everyone gathered, stunned. Over twenty plastic bags in all were removed from the whale’s stomach. John shook his head. In 20 years examining over 200 whales, he said he had never seen anything like this. Suddenly, I felt sick. I struggled not to cry. I couldn’t stop thinking of the nursery in San Ignacio Lagoon where mother gray whales, named friendlies by locals, lifted their calves up beside our small skiff. Some of those females still bore harpoon scars. The gentle grays were old enough to remember whalers who once called them “devil fish” because they so fearlessly fought to protect their young. In the lagoon, I was overwhelmed at the whales’ trust as we reached out to touch them. And now, I thought, we have betrayed that trust. With our reckless obsession with plastic, our careless abandon with trash and chemicals. My emotions were swirling. I knew all about that monstrous mass of plastic floating in the Pacific. Plastics break down into micro-particles, in some places far outnumbering per square inch the plankton that sea life depends on. These particles attract storm runoff containing flame-retardants and PCBs like a magnet – entering the food chain. The plastic toxins are ingested by marine mammals and stored in their blubber, contaminating our orcas and seals. Our Northwest orcas are the most toxic marine mammals in the world. These plastics will contaminate our oceans for hundreds and hundreds of years. Plastic bottle caps that fill the stomachs of sea birds. Plastic grocery bags, mistaken for food, that suffocate sea turtles and other mammals. Plastic rings and box straps that strangle and mutilate. Plastic nets and fishing gear that choke and drown. We have all read the statistics – countless marine mammals, sea turtles and sea birds are impacted each year by our plastics and marine debris. Many thousands die. And now, this beautiful, majestic whale was dead before me**. A whale who sieved the floor of Puget Sound searching for food – but instead, found only our human trash and plastic bags. I will never forget this young whale. We can honor him and wake up to the toll that plastics take on our marine life by the simple act of choosing reusable bags. Like good stewards, we can change our habits – and ensure that future generations can say they share this world with whales and seals and seabirds. It is estimated that 292 million plastic disposable bags are used in Seattle annually with only 13% recycled. Washingtonians use more than 2 billion single-use plastic bags each year. **While the necropsy determined that the trash did not cause the death of this whale, it was one of several contributing factors. However, the large piece of sweatpants could have eventually created a blockage. For a full list of items and photo of the stomach contents of the whale, click here. An average of 2-10 gray whales die each year in Washington as they make the 10,000 mile migration from Baja to Alaska. *MaST (Highline Community College Marine Science and Technology Center) will have the skeleton of the whale on display for educational purposes beginning in Spring of 2012.